Crates consists member's items, make sure your account is able to accept them. The item shown after expanding the row is official and final outcome of your spin, it is added to your winnings and can be claimed anytime. Provably fair odds will be always displayed and available to customer, that means you will always be able to check what percentage (0-100%) system has picked for you. 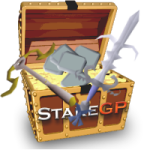 Items will be displayed accurately in your StakeGP items inventory. Once product is revealed customer must accept items delivery without any option of refund or replacement, the only exchange that can exist is purchasing more credits with current item or gold value.